The 76 Shank is a unique, well-balanced design for most disciplines. 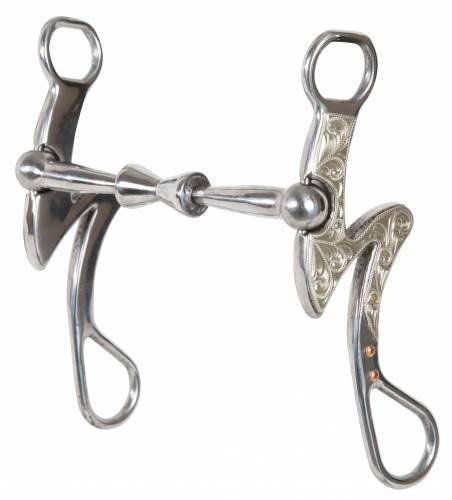 The angle from the headstall connection to the mouth matches the horse's headset, and the angle from the mouth to the rein connection provides a perfect vertical balance for this cheek. These two angles eliminate all undue pressure on the horse's mouth unless applied by the rider. The Rolling Clover mouthpiece allows the rider to get the same response as a traditional bit with less pressure on the reins. By adding tongue pressure that is produced by the roller, the rider will gain more feel without having to use pallet pressure. Can be used on green broke to finished horses.